Welcome to Shred Wise Inc., your best source for paper shredding services in Buena Park, La Habra, and La Palma. We offer customizable solutions for both commercial and residential clients that are secure and cost effective. These solutions include on-site and off-site shredding that’s available on an as-needed basis for one-time purges and on a regularly scheduled basis for ongoing management of sensitive information. By offering these secure, flexible, and dependable paper shredding services at an affordable price, we’ve earned thousands of satisfied clients throughout Orange County and a reputation for offering unbeatable value. We have nearly a decade of industry experience, are NAID (National Association for Information Destruction) compliant, and employ the best practices for secure document destruction. Our small staff has been carefully screened and thoroughly trained, so you can be sure that they will consistently follow the proper shredding process with each and every job. All of our shredding is done with our state-of-the-art commercial shred truck, which features an automatic arm to securely lift and empty shred bins into the shredding area. It uses industrial, high-capacity rotating blades to effectively shred large quantities of paper using a pierce and shred technique. This shredded paper is then commingled with hundreds of pounds of other paper before going to a secure recycling plant. Additionally, we provide those who receive ongoing, regularly scheduled service with lockable bins and consoles to keep their documents secure in between visits. Collectively, our shredding processes, equipment, and services make it easy for our clients in Buena Park, La Habra, and La Palma to comply with today’s privacy law requirements. Call us today for a free estimate. We are open seven days a week: we welcome drop-offs of small numbers of boxes every day of the week and offer mobile/on-site shredding services Monday through Friday. With each shred job, we provide a Certificate of Destruction and guarantee that 100% of the shredded paper will be recycled. 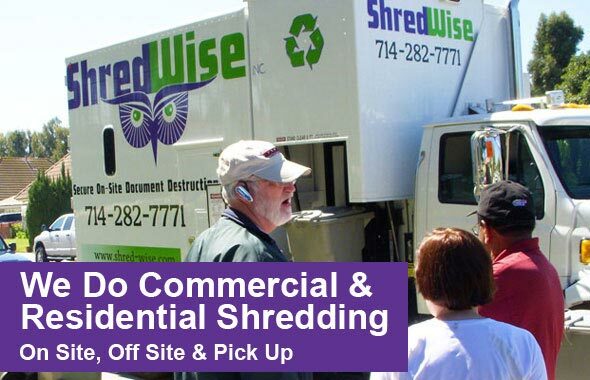 Shred Wise is a family owned and operated shredding company that is dedicated to serving Buena Park, La Habra, La Palma, and other Orange County cities. We are licensed, bonded, and insured; and NAID-compliant. Over the last eight years, Shred Wise has worked with La Habra, La Palma & Buena Park businesses from nearly every industry. As such, we have become extremely familiar with their diverse range of needs and how our document destruction services can best serve them. 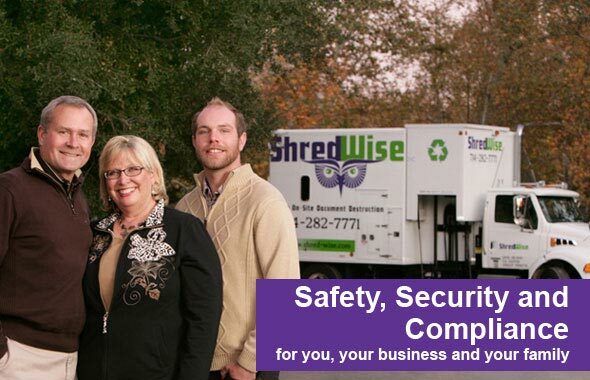 Shred Wise is qualified to meet government shredding needs in Buena Park, La Habra, and La Palma. Government offices have relied on us to securely shred permits, vendor records, planning documents, blueprints, legal documents, bids, financial records, utility bills, human resources files, and contracts. Having helped doctors, hospitals, convalescent homes, medical billing offices, and other healthcare providers in La Palma, La Habra and Buena Park for the last eight years, we understand their unique needs. We provide document destruction services that comply with HIPAA, FACTA, and other local and federal privacy laws, and can help keep charts, patient records, past due notices, doctor charts, and other protected health information safe by offering secure and effective mobile paper shredding solutions. Bookkeepers and CPAs can count on Shred Wise for all of their paper shredding needs. Our on-site and off-site shredding services not only comply with FACTA, GLBA, and other relevant privacy laws, but they are also affordable and customizable. Call us today when you need to securely shred payroll journals, financial statements, sales documents, bookkeeping records, purchase receipts, client personal information, audits, taxes on file, and more. Shred Wise serves a surprisingly large number of local veterinarians and vet hospitals throughout Orange County, and is looking forward to serving yours in La Palma, La Habra, and Buena Park. Paper shredding solutions for veterinarians usually is required because privacy laws require thorough destruction of payment information (credit card information, billing records, payment records, etc.) as well as client information (pet owner records, treatment records, and more). Call today to schedule one-time or ongoing shredding services in La Palma, La Habra and Buena Park. At Shred Wise, we have the capacity, knowledge, and experience to support the document destruction needs of attorneys and law firms in La Habra, La Palma & Buena Park. We can supply you with secure bins and consoles to store your confidential information until they are ready to be shredded; and we can be trusted to safely transport and shred all of your paper. We routinely destroy wills, trusts, court cases, briefs, charts, depositions, discovery, trial transcripts, medical information, and more to protect attorney-client privilege and keep our customers in the legal industry compliant with local and federal privacy laws. 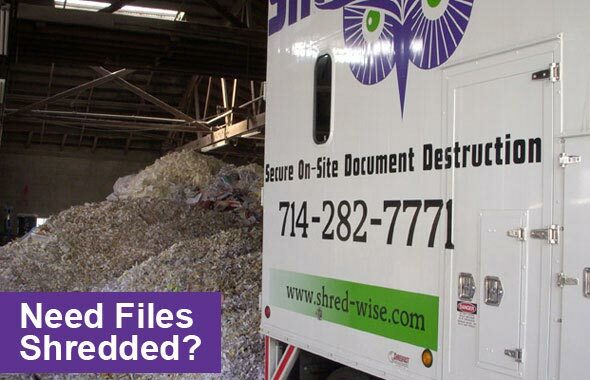 In addition to the shredding solutions listed above, Shred Wise also shreds protected information on behalf of police and fire departments, payroll companies, schools, real estate agencies, aerospace companies, insurance companies, financial planning companies, and more. If you would like to learn more about how we can help you protect your sensitive information and the information of your family, employees, and customers, call us today. We’ll be happy to meet you at your place of business, review what information needs to be kept secure and then properly destroyed, explain our destruction process and the features of our mobile shred truck and support equipment, and provide upfront estimates. In addition to commercial shredding, Shred Wise also offers shredding solutions to residents of La Habra, La Palma & Buena Park. Since residential customers typically have sporadic shredding needs, they typically request one of two options: drop-off shredding or on-site mobile shredding. Drop off shredding involves bringing your sensitive paper items to our facility in Orange, California, and having it shredded while you wait. On-site mobile shredding can be arranged Monday through Friday for any amount of paper. No matter which service you prefer, Shred Wise will always supply you with a Certificate of Destruction once the job is complete. Call today to learn more.